You'll find plenty of places to visit near New Delhi: Gurugram (Gurgaon) (Leisure Valley Park, Sai Ka Angan, & more), Ghaziabad (Mahagun Metro Mall & Shipra Mall) and Worlds of Wonder - Amusement Park (in Noida). And it doesn't end there: take in nature's colorful creations at Humayun's Tomb, contemplate the long history of Gandhi Smriti, enjoy breathtaking views from Qutub Minar, and contemplate in the serene atmosphere at Swaminarayan Akshardham. 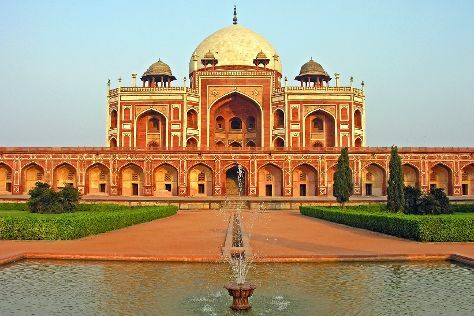 For where to stay, more things to do, ratings, and more tourist information, read New Delhi trip itinerary builder. If you are flying in from United States, the closest major airport is Indira Gandhi International Airport. In December in New Delhi, expect temperatures between 73°F during the day and 48°F at night. Wrap up your sightseeing on the 5th (Fri) to allow time to travel back home.